Chris Atkinson (left) and Alister McRae (right), Malaysian Rally 2011. 1) A perfect start for the Proton R3 Malaysia Rally Team. Proton R3 Malaysia Rally Team starts the season in the best way possible with a 1-3 finish. In fact Atkinson had it so smooth, winning all seven stages of the race except for the 8th and final stage at the purpose built Plaza Angsana circuit at the end of Day 1. Alister McRae completed the perfect day for the team by bringing his Proton Satria Neo S2000 in 3rd place. Before the rally, there were some questions raised about the Satria Neo S2000′s reliability under the harsh condition, given the bitter experience of last season’s outing when both cars developed mechanical problems and suffered an early knock-out. At the end of the rally, Atkinson said that the new suspension system and the development work done on the engine has made the difference from last year’s disappointment. 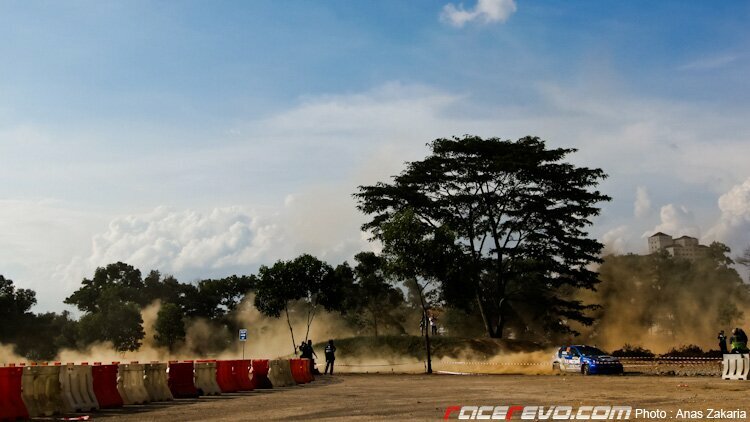 Atmosphere, Angsana Complex special stage, Malaysian Rally 2011. 2) The introduction of the new special stages was brilliant. Palm oil plantation has been the dominant backdrop of any Malaysian Rally event for years. The sight of cars blasting through the tight and twisty special stages through the palm oil plantations is what sets the Malaysian round of the Asia Pacific Rally Championship from the rest. 2011 brought something different with the introduction of the new special stages at the Angsana Shopping Complex. Located at the heart of the Johor Bahru town, spectators were treated with a different rallying atmosphere. As you would expect, the drivers put on a great show and the introduction of the new special stage was an instant hit because of the ease of access for the spectators. They no longer need to take a half an hour ride to Kota Tinggi to watch the action live. For four straight days from Thursday until Sunday, the new 2.5km super special stage provided non stop action. Four times APRC champion Cody Crocker in action in his Subaru Impreza WRX, this time featuring a yellow livery of the Pennzoil GSR Racing Team. 3) It’s good to see some old faces again. It’s a pity that four times APRC champion Cody Crocker had to take a break from rallying in 2010 despite winning the title a year earlier because of the economic downturn. Despite being the most successful APRC champion with four consecutive titles spanning from 2006 until 2009, Cody was left without a drive for 2010 after the Motor Image Racing Team decided to end its three-year participation in APRC. However, it was great to see Cody back in 2011 after a year hiatus, joining another APRC champion Karamjit Singh and Saladin Mazlan at the Pennzoil GSR Racing Team. Runner-up to Karamjit in the 2009 Malaysian Rally Championship, Saladin made a return to rallying after a year on the sideline because of sponsorship issues in 2010, and it looks like the Pennzoil GSR Racing Team will be the force to be reckoned with in 2011. Japanese driver Aki Hatano makes his APRC debut, Malaysian Rally 2011. 4) It’s even better to see a lot of new faces. A total of 35 entries from nine countries including Japan, China, India, Australia and New Zealand took part in the opening round of the championship, making it one of the largest gatherings of rally entries in Malaysian soil. Fan Fan of China set to go in his Mitsubishi Lancer Evolution X. In one of the most tightly contested rally, the emergence of strong competitors such as triple British Rally champion Mark Higgins, Aki Hatano from Japan and Fan Fan from China lifted the competition to a new level. 2011 is shaping up to be a new exciting chapter of rallying in the region. 5) Malaysian Rally proves to be one of the toughest round of the championship. It took only two SS before the course claims its first victim. Overnight rain made the surface slippery and caught Cody Crocker off guard as he skidded and grounds to a halt after his tyre was stuck in a ditch. Last year’s winner Katsu Taguchi was next on the list, as he hit a huge rock in SS3 and tore off his front wheel. Then it was Karamjit Singh after he lost a wheel midway through the same SS and was forced out of the rally. To make matters worse for the Pennzoil GSR Team, Saladin Mazlan suffered mechanical problems. Alister McRae also had trouble in Day 1 with an engine over-heating problems caused by grass clogging the radiator, but was lucky to continue despite losing a lot of time. At the end of Day 1, Hao Yuan, Mark Higgins, Yuya Sumiyama and Rifat Sungkar all failed to get their challenge off the ground. 6) Again, the cliche of to finish first, first you have to finish. Just ask the reigning champion Katsu Taguchi and Gaurav Gill from the MRF Team. In a stark contrast, Gaurav Gill finished the rally in 2nd place while Taguchi had nothing to show for his effort. Gaurav Gill in action in SS2 at the Angsana Complex Special Stages (above and below). There is no questioning the MRF Team duo’s commitment as the pair aggressively attacks the special stages with relentless tenacity. Gill and Taguchi thrilled the crowds every time they pass by, leaving trails of smoke and dust in the air. The same commitment, the same dedication, but in the end with different result. Tail sliding, dirt kicking and stone throwing. APRC defending champion Katsu Taguchi displays his aggressive approach in SS10. Asia Pacific Rally Championship (APRC) will head Down Under for the 2nd round of the championship when Rally of Queensland – Australia commences this 13-15 of May. Meanwhile, here’s some more collection of images from the recent Malaysian Rally.